Hi there! I thought I'd share a couple of layouts I made for my 1st spotlight on the American Crafts blog! I received a delicious package of Amy Tan Sketchbook, Dear Lizzy Neapolitan and Shoreline in my first design team box shipment. Yay, it was so fun to open up that package! 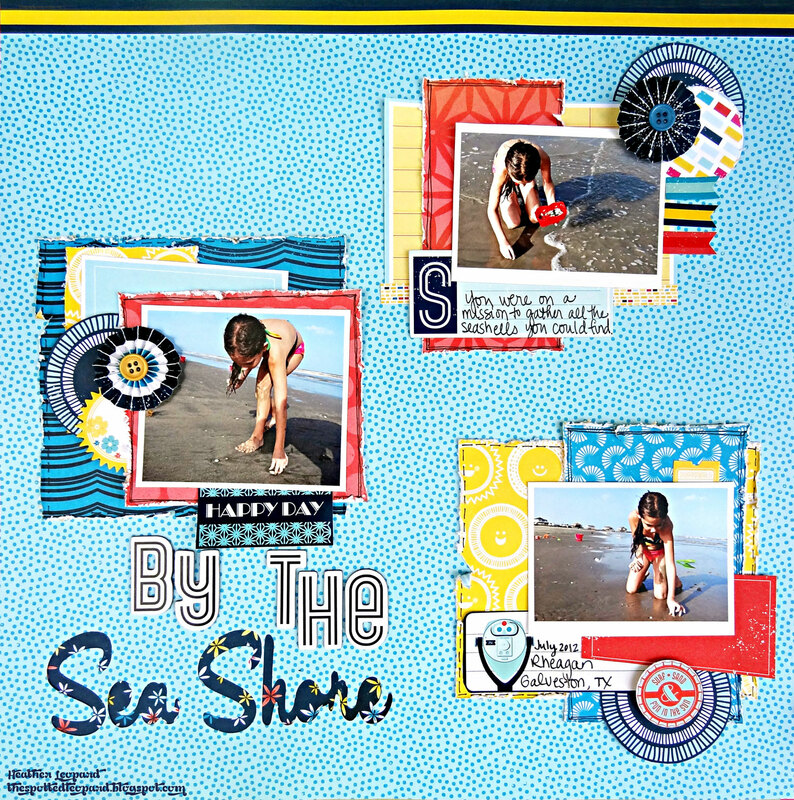 We recently came back from a trip to the beach so I choose to tackle the Shoreline collection they gave me to create with first! 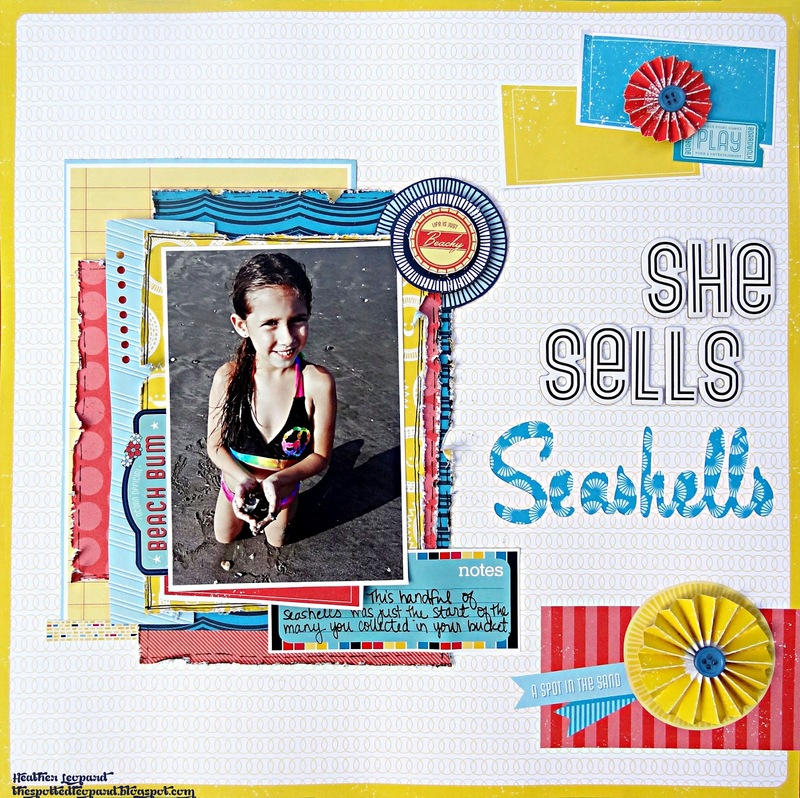 My daughter had a blast searching for seashells. She probably spent a good 45 minutes just walking up and down the beach collecting as many as she could and naturally, I snapped a few photos. 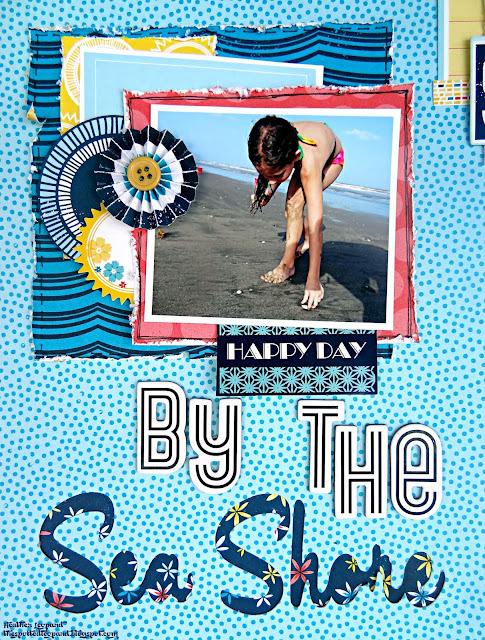 Journaling reads: This handful of seashells was just the start of the many you collected in your bucket. Creative How to: I started both these pages with one thing in mind - the title! 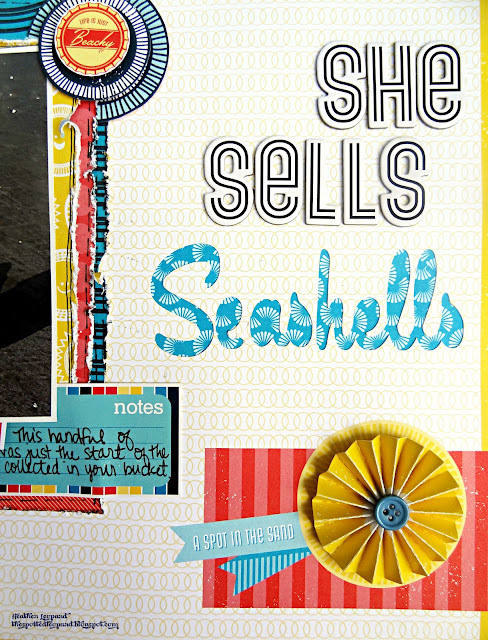 I wanted to use She Sells Seashells by the Sea Shore. I was going to put it all on one page but I decided to break it up so I could of course showcase the photos but also get a bit creative with the title. 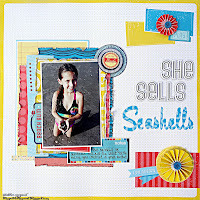 For the first page, I cut the word "Seashells" out of the yellow & white background paper using my CAMEO and tossed the letters but keeping the negative space. I then added the blue & white paper, which I think resembles shells, behind the negative space so that it shows through the paper. I could have just cur the letters from the blue paper but it actually looks nice and "negative-like" in person. Then I added the Thickers for the rest of the title. For the rest of the 1st page, I simply layered a variety of distressed, punched and even wonky cut papers and then added stickers and other elements behind it, adding a bit of doodling and faux stitching. I finished it off by adding the paper flowers. That page can be viewed as a standalone page or together with this one. 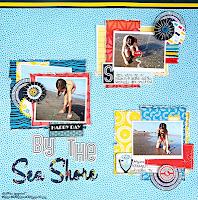 Supplies - American Crafts Shoreline collection: Oceanside Paper (35727) – Shoreline, Coronado Paper (35728) – Shoreline, Ventura (35731) – Shoreline, Edgewater Paper (35739) – Shoreline, Pacific Beach Paper (35737) – Shoreline, Neptune Paper (35729) – Shoreline, Carpinteria Paper (35721) – Shoreline, Vero Paper (35719) – Shoreline, Malibu Paper (35722) – Shoreline, Sea Isle Paper (35732) – Shoreline, Black (53360) – Thickers, Flamingo (42249) – Remarks Book Accent & Phrase Stickers, Surfboard (85584) – Delights Paper Flowers, Solid Adhesive Runner (61719) – This to That, Foam Dots (61709) – This to That, Black (62311) – Precision Pen 03. Journaling reads: You were on a mission to gather all the shells you could find. 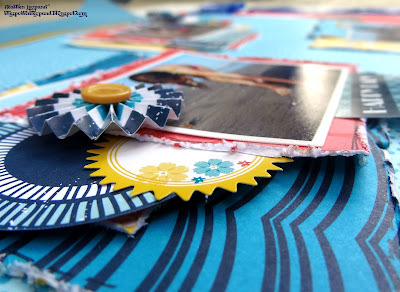 Creative How-to: Just like the page before, I cut the title from the background paper revealing the negative space. I then added the rest of the title. I usually do this step last but I wanted to make sure it all worked out as I envisioned it. Then, to show the magnitude of my daughter’s quest to find as many shells as she could, I made little mini scenes on the page by layering the photos, paper and embellishments. This page can be seen as a standalone page but when you put the two pages together, like in an album, you see the entire story. And I love that the background papers aren't the same. I think it adds zest! Holy moly, I'm on the American Crafts design team!!!!!!!!!!!!!!!!!! so bright and eyecatching, I love this collection! 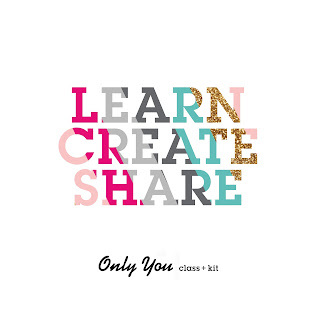 I always wondered how much material u were given to start with that could be overwhelming! Great job on your layouts. 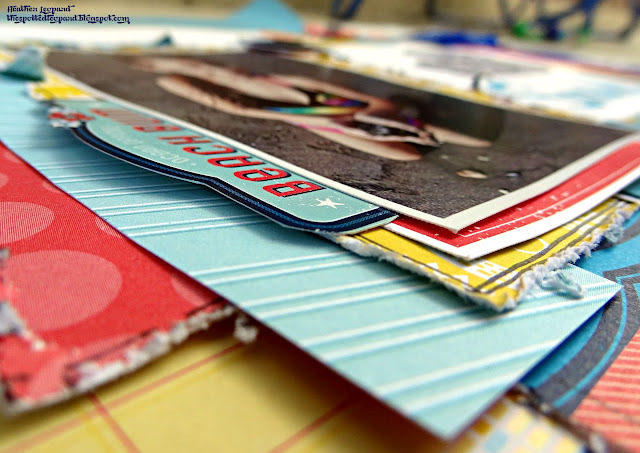 Perfect papers and colors for those cute pics. These are gorgeous!! I loveeeeeeeeeee the colors and the layers!! !